I typically go for lots of color but sometimes soft neutrals can be so refreshing. I have totally gone a little crazy for these pale grey Current Elliott skinnies (if you haven’t noticed ;). Is there a piece in your closet you can’t stop wearing? Love the soft neutral colors!! So pretty on you! You are so pretty ! Nice outfit, I’m discovering your blog and I love it ! Love neutral outfit like this one, very classic. This is such a simple but classy look. Love a good monochrome moment like this! You look gorgeous! 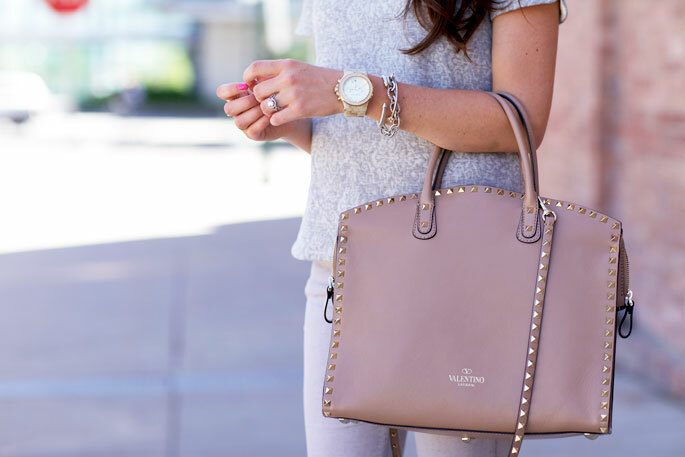 The Valentino Rock Stud bag really makes this simple outfit look more luxurious! I love all of your more casual styles, but these neutrals are by far my favorite. and I love that lip color. Love the monochromatic look – I’m a fan of the light gray colors. Very nice look :) love the colors. Love this! Usually you see neutrals in the form of tans and blacks, but this soft grey has a great hint of violet to it! So sweet! Loving this look and love the wash of those jeans!! Gorgeous as always! SO chic. Always love switching it up with a good neutral outfit! This is such a pretty look on you. I really like these colors together, it’s a perfect combination for summer. This is a great look! Love the bag! Very pretty!!!!!! Sometimes it’s nice to branch out from our normal look. I love this monochrome look but playing with the shades and textures! That top looks so comfy! Love the tones of the look and the beautiful bag! i am obsessed with those jeans, so no wonder you are too! :) they’re the perfect color. Love your style, the shoes are amazing! I love this neutral pallete! You look great. I love those grey skinnies! I can’t stop wearing my Current Elliot boyfriend jeans. They are so comfortable and can be dressed up or down. This is so pretty! I love the cropped jeans. Great way to play up a casual outfit and the neutrals are perfection. So pretty. The neautral colours are so refreshing! love how you styled this. I love this soft neutral look! That jacquard sweat shirt is the perfect top for summer! So many things are soo right about this outfit. I am OBSESSED! You nail it every time and I love it. Love the soft color combo. Your outfit looks comfortable and perfect for going out for any occasion. It’s refreshing to see bloggers feature items that they’ve worn before (your grey skinnies). :) You don’t always have to wear something new! I love this look! You are so gorgeous! You are such an expert in soft colors. The beauty about this assemble is that it is color but also natural the same time. I’m loving this look! All the soft neutrals are so lovely together! Wow, I adore this look. Its so feminine, and summer appropriate. Your rocking the pastel summer trend. Wolors are so sweet <3 The whole outfit is perfect. Love to wear heals with a 7/8 skinny. I’m loving the soft understated makeup…beautiful! loove the jeans of course but also the details on the blouse are beautiful! I love this simple, all neutral look! So chic. Wow, you look stunning in this neutral ensemble. Usually I prefer pops of color with my neutral looks but you styled this to perfection! Your make up looks so beautifull as well. I love how you are showing us so mant great looks with these versatile grey skinnies. I have always loved grey denim for the variation that it brings. Right now, my favorite item is my Hue pointe leggings. I reach for them so much to wear with everything from ballet flats, heels, and Converse kicks! Also, love that new Michael Kors watch!! I am obsessed with that bag! Great look. I love neutrals and these are perfect on you! The one item I live in during the summer is my JBrand white skinny jeans! So versatile! Gorgeous as always! I was wondering if you have any recommendations for summer wedding sandals/heels. I have been searching for a while for a nice strappy sandal that could be worn again, and that isn’t too high, but haven’t had much luck. Thanks for any help you could give! Love the top! So cute and classic! You look amazing! I love he soft tones of these neutrals! I’d love to know how you take care of your Louboutins? I’m always scared to wear mine out and scuff them! Love the neutral look : ) I tend to go for this more so than brighter colours. Really like your grey textured top! I have a pencil skirt the same exact color/print/texture as your top & I love it! I’ve been following your blog for so long and love your style. You always look so put together but still chic. I’ve been looking everywhere for mix & match separates for work (a skirt with matching top) and I can’t find the perfect combo. I thought you might know where I could. Any ideas? ?